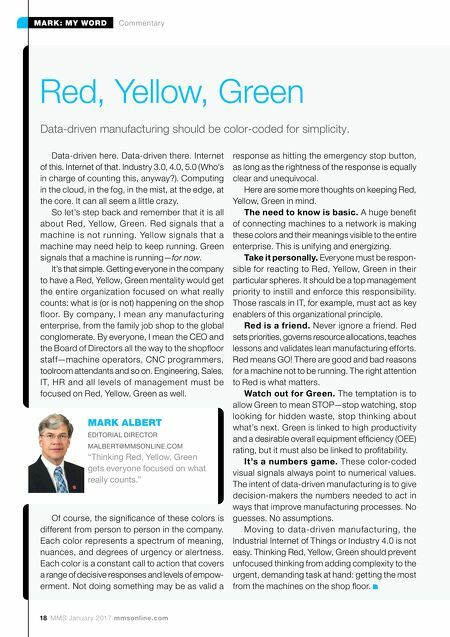 18 MMS January 2017 mmsonline.com MARK: MY WORD Commentary Red, Yellow, Green Data-driven manufacturing should be color-coded for simplicity. Data-driven here. Data-driven there. Internet of this. Internet of that. Industry 3.0, 4.0, 5.0 (Who's in charge of counting this, anyway?). Computing in the cloud, in the fog, in the mist, at the edge, at the core. It can all seem a little crazy. So let's step back and remember that it is all about Red, Yellow, Green. Red signals that a machine is not running. Yellow signals that a machine may need help to keep running. Green signals that a machine is running—for now. It's that simple. Getting everyone in the company to have a Red, Yellow, Green mentality would get the entire organization focused on what really counts: what is (or is not) happening on the shop floor. By company, I mean any manufacturing enterprise, from the family job shop to the global conglomerate. By everyone, I mean the CEO and the Board of Directors all the way to the shopfloor staff—machine operators, CNC programmers, toolroom attendants and so on. Engineering, Sales, IT, HR and all levels of management must be focused on Red, Yellow, Green as well. Of course, the significance of these colors is different from person to person in the company. Each color represents a spectrum of meaning, nuances, and degrees of urgency or alertness. Each color is a constant call to action that covers a range of decisive responses and levels of empow- erment. Not doing something may be as valid a MARK ALBERT EDITORIAL DIRECTOR MALBERT@MMSONLINE.COM "Thinking Red, Yellow, Green gets everyone focused on what really counts." response as hitting the emergency stop button, as long as the rightness of the response is equally clear and unequivocal. Here are some more thoughts on keeping Red, Yellow, Green in mind. The need to know is basic. A huge benefit of connecting machines to a network is making these colors and their meanings visible to the entire enterprise. This is unifying and energizing. Take it personally. Everyone must be respon- sible for reacting to Red, Yellow, Green in their particular spheres. It should be a top management priority to instill and enforce this responsibility. Those rascals in IT, for example, must act as key enablers of this organizational principle. Red is a friend. Never ignore a friend. Red sets priorities, governs resource allocations, teaches lessons and validates lean manufacturing efforts. Red means GO! There are good and bad reasons for a machine not to be running. The right attention to Red is what matters. Watch out for Green. The temptation is to allow Green to mean STOP—stop watching, stop looking for hidden waste, stop thinking about what's next. Green is linked to high productivity and a desirable overall equipment efficiency (OEE) rating, but it must also be linked to profitability. It's a numbers game. These color-coded visual signals always point to numerical values. 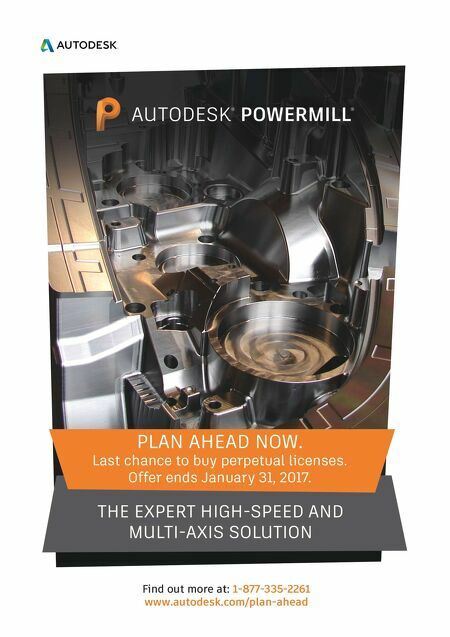 The intent of data-driven manufacturing is to give decision-makers the numbers needed to act in ways that improve manufacturing processes. No guesses. No assumptions. Moving to data-driven manufacturing, the Industrial Internet of Things or Industry 4.0 is not easy. Thinking Red, Yellow, Green should prevent unfocused thinking from adding complexity to the urgent, demanding task at hand: getting the most from the machines on the shop floor.